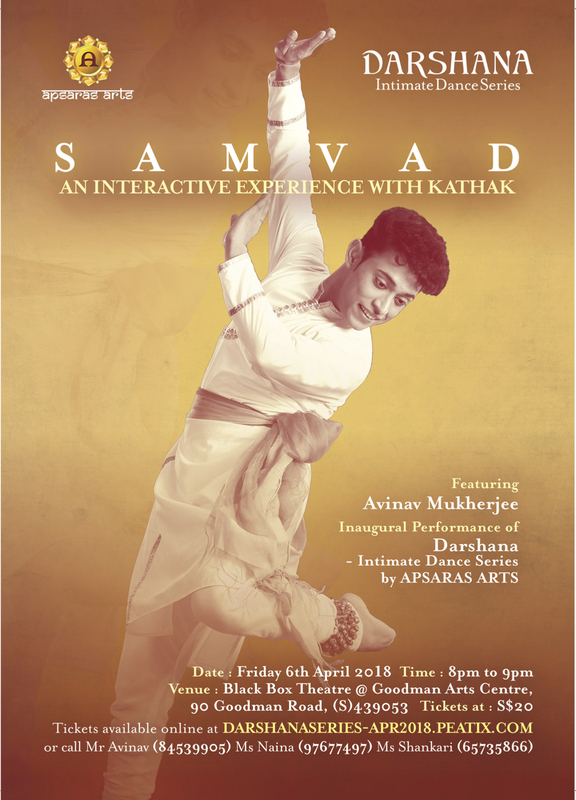 “Samvad - An interactive experience with Kathak" featuring Avinav Mukherjee, Kathak dance artiste and faculty member of Apsaras Arts, Singapore, will be presented as the inaugural performance of “Darshana - Intimate Dance Series” by Apsaras Arts. In this exciting performance Avinav will take his audience on a journey to experience finer nuances of the classical dance form of Kathak, with a line up riveting repertoire choreographed by dance doyen Guru Geetanjali Lal, to be performed in Singapore for the first time ever. Avinav Mukharji, is the disciple of the Kathak legend Guru Geetanjali Lal. He is a graded Doordarshan artiste and the recipient of various scholarships from leading institutions including, C.C.R.T, Sahitya Kala Parishad and Kathak Kendra, New Delhi. Avinav has performed in India and overseas in several prestigious festivals. He was awarded 'Natya Mayooram' by Chattisgarh government and 'Nritya Jyoti' by Odisha government. Avinav is a Kathak dance artiste with Apsaras Arts Dance Company and the Kathak faculty member with Apsaras Arts Dance Academy in Singapore. Most classical dance forms of India are best appreciated in its intimate setting in close proximity, where the solo dancer is in constant communication with the audience. Many of these dance forms were originally performed in the sanctum of the Hindu temples, then later moved to the royal courts of great rulers, both these settings giving the ideal experience. In the early twentieth century these solo performances were formatted for grand proscenium stages, which have now evolved as ensemble works featuring multiple dancers. Through this dance series “Darshana”, Apsaras Arts intends to recreate the ancient setting where the audience and the soloist are in unison enjoying the ultimate experience of “Sahrdya” - oneness with each other. Darshana will feature solo performances across the genres of Indian classical dance, with each performance featuring a serious dancer presenting a curated thematic performance, putting the focus lights on Singapore based Indian classical dancers.